This post originally appeared on Our Fresh Kitchen, a healthy food project I started with my partner Hector. I really wanted to share it here because it’s such a crazy cool way to get your legumes! Most wonderful things start out with a crazy idea. Some people say it’s because you have to see the world a little differently to create something wonderful, but I think wonderful ideas are all around us and the trick is following where they lead. Running outside during a polar vortex deep-freeze, on multiple occasions. Trying to qualify for the Boston Marathon with 10 weeks of training (not recommended). Moving to Singapore for four months on an academic exchange. Signing up for an Ironman (we’ll see how this one goes). The cool thing about crazy ideas is that even if they don’t turn out the way you expected, you usually learn something or at least have a good story to tell. In this case, it resulted in possibly the most versatile (in a dietary sense) healthy lentil muffin recipe you’ll ever make. These moist and lightly sweetened muffins have some pretty awesome fiber and protein, and can be made vegan, gluten-free, dairy-free, and either nut-free or soy-free depending on what type of milk you use. If you don’t have some of these ingredients, don’t worry. Not everyone has a kitchen equipped with the ingredients for vegan and gluten-free baking, and that’s totally cool because just about everything even remotely specialized about this recipe can be substituted with the most basic ingredients you have. Don’t have chia seeds? Use flax meal or egg. Almond milk? Soy or dairy milk will work too. The only extra step – compared to regular muffins – is cooking the lentils, and that hardly takes any time at all. Bring water and salt to a boil, then add dried lentils and simmer for 20-30 minutes; you’ll know they’re done when all the water is absorbed and you have a creamy brown sauce. The lentils can cook while you preheat the oven and get everything else ready. By the way, brightly coloured silicon baking cups are fantastic. You don’t even need to grease them, and they look so pretty when they’re all ready for muffin batter. …and after about 10 minutes you get a nice thick gel that replaces the eggs in traditional baking. If you don’t have chia seeds, you can substitute 1:1 with flax meal to keep it vegan or use two eggs (in this case leave out the water too) and skip the 10 minute wait. While the chia seeds are working their magic, mix together the dry ingredients in a separate bowl. I prefer quinoa flour for baking because I find it has a good texture in most recipes, is sold in my local grocery store and means I don’t need to keep five different types of flour in my pantry (not that I don’t have five types of flour in my pantry – I just don’t need to). If you’re gluten-sensitive, you can try using other gluten-free flours like rice, almond or coconut, but I haven’t tested anything other than brown rice flour. On the other hand, if you can eat wheat, then regular whole wheat flour (possibly with some wheat bran) is also an option – just leave out the xanthan gum. Once the lentils have finished cooking, add them to the chia gel along with the remainder of the wet ingredients – just be careful not to stir too enthusiastically at first or the oil might go everywhere (like mine did). I generally use unsweetened almond milk in my baking, but any milk will work here; soy, coconut and flax milk are all good options to keep the recipe dairy-free, and regular cow’s milk works too. So go nuts – or should I say nut-free? Finally, add everything together and mix until you get a nice fluffy batter and all the lumps are gone. Spoon the batter into your brightly coloured baking cups (you have those right?) or greased muffin pans, dividing it evenly between 12 cups. The muffins don’t really rise, so the batter should be mounded over the tops of the pan. Bake at 350F until a toothpick stuck in the center of the muffin comes out clean, which takes about 20 minutes. Let the muffins set in the pans for about 5 minutes, then cool them completely on a wire rack. If you’re not eating them right away (I can never resist eating one straight out of the oven), they will last several days at room temperature, up to a week in the fridge or about a month frozen. Before serving, thaw and reheat them in the oven at 250F for 10-15 minutes. In a medium saucepan, bring water and salt to a boil, then add lentils and simmer on low for 20-30 minutes until water is absorbed. While lentils are cooking, preheat oven to 350F and grease muffin pans. In a large bowl, combine chia seeds and water, letting them sit for 10 minutes until the mixture forms a thick gel. In a smaller bowl, combine dry ingredients. Add cooked lentils and remaining wet ingredients to chia gel and mix well, then add dry ingredients and dates or walnuts. Stir until combined. Spoon batter into muffin pans and bake at 350F for 20 minutes, or until a toothpick inserted at the center comes out clean. Cool in pans for 5 minutes then remove to cooling rack. Store in a sealed container for several days, or freeze to enjoy whenever you wish. It’s official – Friday night has been declared Pizza Night in the Kim-and-Hector kitchen. But when I say pizza, I’m not talking about 2,000-calorie mounds of dough and cheese that make you feel guilty and slightly nauseous the next day; I’m talking about a crisp homemade crust covered with roasted sweet potatoes and red onions, mozzarella cheese and crunchy balsamic kale. This is not Pizza Hut pizza. This is so much better. So here’s how Pizza Night works: every week we choose a different kind of pizza, based around an ingredient we want to try or a neat recipe we found. Last week we chose kale because I got a giant bunch in my bi-weekly produce box, and the search for a unique recipe resulted in this gem from Two Peas and Their Pod: Sweet Potato Kale Pizza with Rosemary and Red Onion. I’m sitting at my desk with a delicious peanut buttery oatmeal cookie sitting all alone looking at me, just daring me to eat it, and I’m trying really hard to resist eating it until after my spin class tonight…but I’ve got the last-Friday-before-a-recovery-week munchies and pretty much want to eat everything in sight! I already ate its sibling, as well as a Ferrero Rocher chocolate which somehow slipped into my lunch bag this morning. Oops. This recipe has been updated! Version 2 can be made vegan and gluten-free, and you can find it here: Spiced Lentil Muffins. Now I get that you might be feeling a little skeptical about lentils in muffins but just hear me out. You trusted me on the zucchini chocolate cake, right? And look how well that turned out! Just try them, and you’ll never look at a lentil the same way again. By now, you might have realized that I have a teensy bit of a muffin fetish. They’re so easy to bake, incredibly versatile and very portable – what’s not to love? So when I ended up bored around the house on a Saturday afternoon, what else was I to do but create the recipe I’ve had floating around in my head for a month? It’s a quick update today, but after four days on the Wild Rose Cleanse, I still haven’t had those terrible first few days everyone talks about. No cramping, no GI issues, no headaches and normal energy levels. I also realized that the Wild Rose diet is basically what I always eat, with the exception of dairy, sugar and flour. Not too difficult to find delicious ways to cook with all that’s left! I had a total revelation last week (and it resulted in an awesome recipe, at the bottom of this post). Since I’m no longer training, I decided to do a little nutritional “experiment of one” around sugar and stimulants (i.e. caffeine). I was inspired by my sister who recently cut out all sugar – and I mean all sugar, even natural sugars like honey, fruit, dairy and anything else containing lactose, fructose or glucose – after learning sugar is one of her food sensitivities. I figured I’d give it a try and see what happened. Although I planned to start my no-sugar, no-caffeine diet on Monday, I only lasted until about 4pm so I didn’t technically start until Tuesday. But seriously, not eating any sugar is freaking hard ’cause that stuff is in everything! No raisins in my yogurt, no banana, no chocolate – definitely not something I could keep up long term. Between 30 and 60 minutes after eating sugar, even if I’m not hungry, I get a strong desire to eat – specifically sugar and junk food cravings, but I just feel the need to eat something. This craving goes away if I wait about 15 minutes without eating. I spent most of the summer wondering why I constantly felt a need to eat even when I wasn’t hungry, but then I’d snack on fruit because it’s delicious and good for you. Vicious circle ensues, leaving me feeling simultaneously guilty and unsatisfied. But I also learned something else about sugar cravings this week: excessive sugar cravings are a sign of overtraining, according to page two of Avoiding Late-Season Burnout from Inside Triathlon. I’d never made that connection, but it makes sense and might have made it’s own contribution too. My final discovery this week was the BEST BREAKFAST CEREAL EVER. Homemade, gluten-free/low, totally sugar-free (unless you put raisins in it like I do) and so many variations: basically pick any combination of seeds and grains, mix them with some sort of dairy or non-dairy milk or yogurt and let them sit for about 15 minutes then enjoy! I throw it all together in the morning when I get up, and it’s ready by the time I’m out of the shower. Mix everything together, then let it sit for at least 15 minutes so the chia seeds have time to gel. This recipe was born when I was in a chocolaty mood (as with most delicious things), but don’t let that fool you – these muffins are a much healthier version of your typical double chocolate muffin, so they’re guilt free too! I have to admit, this recipe is a little weird because I wanted to make a dozen large muffins and 16 small muffins so I have a variety of sizes around depending on how much I feel like eating. I’ll be modifying the amounts for only the one dozen regular sized muffins, but I had a lot of demand for the recipe after sharing my muffins last night, so in the meantime you can either multiply the recipe by about 2/3 or you can make extra muffins (I know which one I’d choose). Preheat oven to 350F and grease muffin pans (don’t use liners because they will stick). In a large bowl combine all the dry ingredients in the first section above. In a smaller bowl combine wet ingredients, leaving out the chocolate chips. Add wet ingredients to dry, and mix slightly. Add chocolate chips and stir just until combined, leaving the batter a bit lumpy. Spoon into muffin pans, filling each right to the top. Bake at 350F for 20 minutes or until a toothpick inserted in the centre comes out clean. Let cool in the pans for a few minutes then remove and cool completely on a cooling rack. With the start of my marathon training, I’ve renewed my focus on nutrition and just finished reading Matt Fitgerald’s book Racing Weight to get a better understanding of the specific needs of endurance athletes. The premise is simple: the more non-power-producing weight (i.e. fat) you are carrying, the slower you will be relative to your leaner self. This is pretty obvious to most of us, but what I like about Racing Weight is the way it approaches what is often (but not always) weight loss. An important reminder for me is that the goal of optimizing my nutrition is not to lose weight, the goal is to get faster. Being a controlling A-type personality with lots of willpower means I can starve myself into slower race times without even realizing it, because I’m not even coming close to meeting my nutritional needs. Remember: the goal is to get faster; the goal is not to lose weight, although losing weight may be a means to the goal. There is some wonderfully detailed (and scientifically-backed) discussion covering how improvements in your diet quality will optimize your body composition and provide the energy and nutrients needed to fuel and recover from workouts, and specifically what is required for athletes as a subset of the general population. While a large section is dedicated to methods of quantifying and improving diet quality (which is a huge component of proper nutrition), the part I am most excited about discusses macronutrient requirements – specifically carbohydrates and protein – which is precisely the information I have had so much trouble finding! Carbs are the primary fuel used in muscle contraction so obviously endurance athletes need a lot more of them, which is why I’m stuffing my face with a banana as we speak (you think I’m kidding). What nobody seems to agree on is how much us crazy endurance athletes actually need! Carbohydrate requirements actually increase with training volume, so a single number isn’t going to work for everyone all the time. Based in the information in Matt’s book, my training volume of about 7 hours per week means my daily requirement is about 395g, and more during heavy weeks. Because I’d like to eat as many carbs as required without overdoing it in the calorie department (I have a very “efficient” metabolism), I came up with a list of foods which have the greatest quantities of carbohydrates per calorie and thought it might be useful information for anyone else in the same situation. Of course my overall strategy of focusing on less processed and more natural foods still applies, so just because sweetened dried cranberries are high up on the list doesn’t mean I consider them a staple! Another interesting tidbit: pure carbohydrates contain 4 calories per gram; lower numbers mean that the carb total includes insoluble fibres which aren’t absorbed, and higher numbers mean calories are provided by nutrients other than carbohydrates (and you’ll notice that many of the foods in the carb list also have significant amounts of protein). Also, there is a very good likelihood that I missed your favourite carb. This is not cause for alarm, simply let me know and I’ll add it. Protein has always been a touchy subject for me because usually the first question I get upon revealing that I am primarily vegetarian is: “but how do you get enough protein?” First of all, most people eat far more protein than they require (daily recommendation is about 0.8g/kg), and second, protein is in a far greater variety of foods than people imagine. Many vegetables and grains contain significant amounts of protein, and while they may not contain all the essential amino acids on their own, eating a varied diet throughout the day is usually adequate for meeting your amino acid requirements. Athletes typically need more protein than the general population as it assists with muscle repair and recovery, and helps replace your carbohydrate stores following a workout. I have seen a huge range in the quantity of protein recommended for athletes (anywhere from 1.1 to 1.6 g/kg), but Matt Fitzgerald more specifically recommends 1.2 grams per kilogram of body weight; I would suggest trying more and less to see what makes you feel better, since not everyone needs the same amount. I have always targeted about 60g of protein per day, and was pleasantly surprised to find I was already close to my calculated daily requirement of 66g. For the same reasons I mentioned above, I like knowing my most efficient protein sources on a calorie basis. The important thing to keep in mind is that many foods that are not calorically efficient as a protein source still contain healthy fats and other nutrients and minerals that are incredibly healthy and part of maintaining a varied diet. Don’t avoid almonds just because they pack 27 calories per gram of protein – you’ll still benefit from eating them! As with carbohydrates, proteins contain 4 calories per gram; typically foods on this list contain more fats and other nutrients, which results in a greater number of calories per gram of protein. Be careful about consuming too much fat with protein as it can interfere with absorption. The list below is tailored to my diet, since I am primarily vegetarian plus fish and do occasionally eat chicken and other meats. I didn’t include your delicious t-bone steak and definitely have some foods that not everyone likes, so if you would like me to add a food just let me know (adding phrases like “pretty please, with a cherry on top?” generally gets my attention faster). If you’ve been paying attention, you’ll notice that I didn’t talk about fats at all. That’s on purpose, and due to the simple facts that they’re not as important to endurance sports as protein and carbohydrates, and most people more than meet their daily fat requirements just through eating normal amounts of healthy food. I eat more fat because I find that I feel much better on a higher fat diet, have fewer non-hunger food cravings and have healthier skin and nails than when I restrict my fat intake. I also prefer full-fat dairy products because they’re less processed and therefore more natural, and because they taste so much better than low-fat versions – and honestly? I don’t eat food that doesn’t taste good, no matter how healthy it is! Just ask me how long it took to find a way I like kale, and how vehemently I refused to eat it before then. Speaking of kale, I believe there will be a kale recipe joining the blog before long, so keep your eyes peeled so you don’t miss it. I know how disappointed you would be. Nuts and seeds are an often-overlooked category of food that contain many essential nutrients and minerals; chia seeds have recently become incredibly popular for their many health benefits, but they’re not the only seed you should be adding to your diet. Not only are all of these seeds incredibly healthy, they also have a few specific benefits for athletes! Water-soluble fibre, which slows digestion and regulates blood sugar. Omega-3 fatty acids support the nervous system and healthy brain function. Phosphorous, which is used to synthesize proteins, carbs and fats for tissue growth and repair. Manganese to regulate metabolism and assist with the formation of connective tissue and healthy bones. Tryptophan improves both sleep and mood and regulates appetite. Minerals help repair tissues damaged through exercise and improve sleep, both of which speed recovery. Chia seeds absorb large amounts of water, making them a great option for boosting hydration. One study compared carbo-loading using a drink with 100% of calories from Gatorade to one with 50% of the calories provided by Gatorade and 50% by chia seeds; the chia mixture provided the same results but with a better nutritional profile (more Omega-3s) and less sugar. Chia seeds have traditionally been used by endurance athletes such as the Tarahumara, and were mentioned in Chris McDougall’s book Born to Run. Alkaline-forming, which counteracts bone loss as a result of low body pH and can improve energy levels and immunity. Complete protein, containing all the essential amino acids. Magnesium helps with body temperature regulation, transmission of nerve impulses and the absorption of calcium, and improves muscle function. Zinc strengthens the immune system and is needed for growth and cell division. Intense workouts temporarily suppress the immune system, so getting enough zinc can help protect you from that nasty flu everyone else is getting. Studies show that insufficient magnesium can result in muscle weakness, particularly during hard training weeks. Selenium is an antioxidant and plays a key role in metabolism. Vitamin E lowers cholesterol, improves immunity and protects cells from damage by eliminating free radicals in the body. Selenium helps protect muscles from damage, allowing your body to recover faster from a hard workout. Vitamin E supplements have been shown to counteract the increase in lipid oxidation associated with extreme exercise, reducing muscle damage and speeding recovery. Calcium supports healthy bones and teeth. Iron and copper are used in the production of red blood cells, and copper helps with thyroid function and the formation of connective tissue. Good source of magnesium (see above). Variety of minerals such as phosphorous, zinc and vitamin B1. Sesame seeds are particularly beneficial for runners because the mechanical forces associated with running destroy hemoglobin at a faster rate and therefore increase production of red blood cells. Women are especially prone to developing runners’ anemia, and often require iron supplementation. Magnesium is important during hard training weeks (see above). Cranberry Orange Seed Bars (inspired by Endurance Crackers from Oh She Glows) are a tasty, vegan, nut-free and gluten-free way to enjoy a variety of seeds. Preheat oven to 325F. 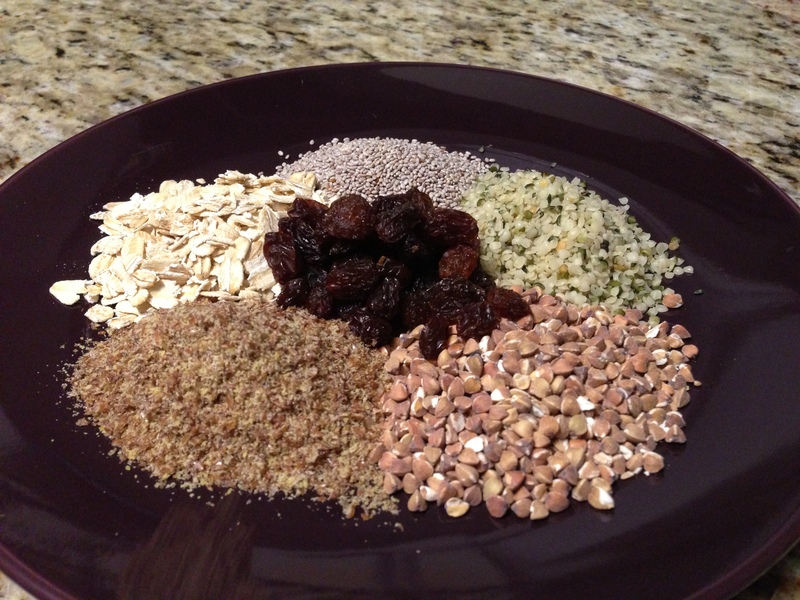 In a medium bowl, mix seeds, dried cranberries and cinnamon. Combine warm water and honey/sugar and stir until dissolved. Add vanilla and orange zest and stir to combine. Add water mixture to seeds and stir until chia seeds begin to gel and the mixture thickens. Let sit 2-3 minutes, then add flour and stir well to combine. Pour onto parchment paper and spread with the back of a spoon until the layer is 1/4 to 1/2 inch thick. Bake at 325F for 30 minutes, then cut into bars. I like to cut bite-sized diamond shapes, but feel free to adjust the size and shape of your bars. Flip and bake another 30 minutes until edges are golden brown and crispy. I used white rice flour, but feel free to try different wheat, oat or gluten free flours. Some may work better than others and the only one I’ve tested is white rice flour so do so at your own risk! I prefer to sweeten with honey, however I am aware that many people do not consider honey to be a vegan product; you may wish to substitute an equal amount of packed brown sugar to make the recipe unequivocally vegan. For an extra sweet treat, drizzle melted dark chocolate over the bars after they come out of the oven; they won’t be quite as healthy, but come on, it’s dark chocolate! I don’t need to explain this to you. I like small diamond shaped bars, but really you can cut them into any shape or size you like – even animals if you have cookie cutters! I like diamond shaped bars, but you can cut any shape you like. These bars are a nutritional powerhouse with 56 calories per serving, 5.7g carbohydrates, 2.2g fibre and 2.9g protein. Now go take on the world!